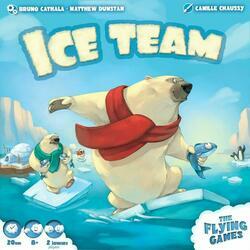 At the head of your Bear team, take part in a frantic race and try to get the most fish on the finish. Warning: on this sliding ice floe, moving and fragile, all shots are allowed! Ice Team is a 2-player racing game in which you will have to bring your polar bears as quickly as possible to the finish line, having collected as many fish as possible igloos. Each turn, a player moves one of his 4 bears in all directions on round ice tiles with an ice cube, an igloo (hiding fish) or a penalty (like a seal, removing fish). Once the pack ice is visited, the tile is removed from the table, creating an unusable space for future turns. The player who manages to reach the finish line with the most fish wins.